Microsoft's event today was long on promise and short on specs. RAM? We dunno. Processor speed? We dunno. Price? We dunno. Release date? We dunno. But even a very brief hands-on made something abundantly clear: It's a super solid device and if Microsoft can deliver what it demoed, the iPad finally has a real competitor and Android has a big goddamn problem. Microsoft kept touting build quality, and for good reason: the Windows RT Surface tablet is solid and stunning. Attention to detail is positively amazing, and it's so well designed from every angle that it's just a joy to look at. The keyboard is so thin it seems made from fabric. The lines are gorgeous, and it's a well-balanced device that you'll be able to hold for extended sessions. It is, certainly, easier to hang on to than any of the three generations of iPads to date. The screen is bright and vivid, and the viewing angle is as wide as you could reasonably expect to hold it. Even the kickstand that lets it sit upright, which seemed kind of, well, dumb onstage was a fantastic touch once we saw it in person and attached to the keyboard. It's also fast and responsive. When we flipped through an app, going from snap state to full screen, it blazed faster than your average reggae band in Humboldt County. Touching led to instant firing. We don't know what kind of processor or RAM is in there (mysterious!) but it's ground-up quick. And then there's typing on it. We couldn't do that! 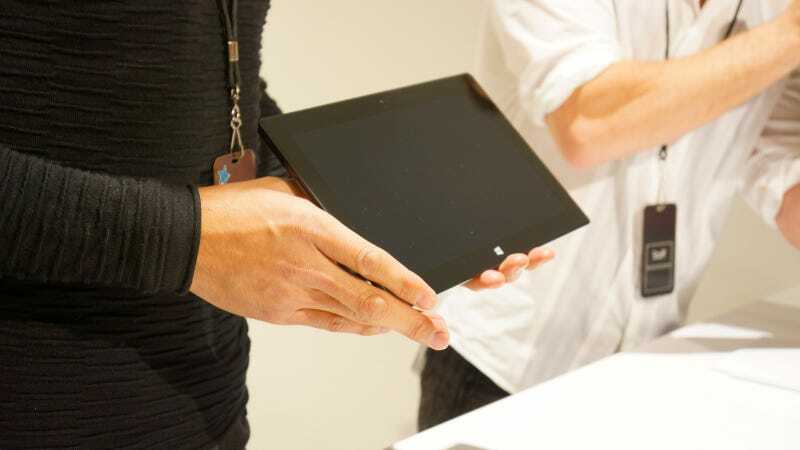 Notably, every single Surface tablet Microsoft let us put our hands on either was turned off, or didn't have a keyboard connected. I kept hearing how quickly you could type on it—"I did 63 word per minute the first time I used it," one Microsoft employee told me—but there was no way to try this out for ourselves. So. Yes. It's awesome. It's going to be fantastic. Google had better step things up at IO, because this Windows RT tablet is far more impressive than any shipping Android tablet I've ever seen. It's a clear rival to the iPad. Or at least, so it seems. We'll see. Can't wait for Fall.